At this time Bhai Amarjeet Singh was on duty under the command of SSP Sardar Simranjeet Singh Mann. All officers under the command of Simranjeet Singh Mann became strict followers of the Sikh religion which was highly due to the parchar (preaching) of Bhai Amarjeet Singh within the station, along with colleagues Bhai Seva Singh & Bhai Gurnam Singh. 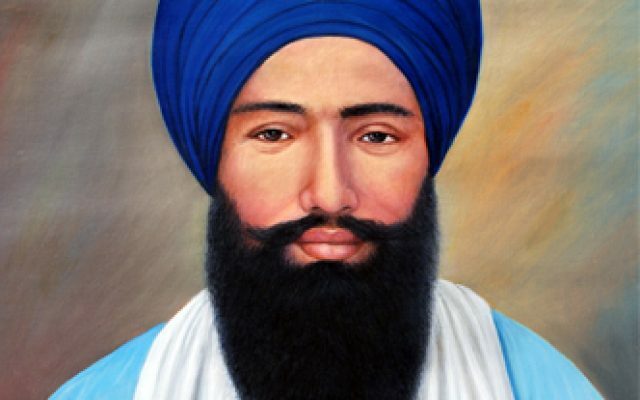 Following the Amritsar massacre Bhai Amarjeet Singh, Bhai Seva Singh & Bhai Gurnam Singh began to continue in their Panthic seva outwith the Panjab police and directed their attention to punishing the perpetrators of the Amritsar massacres. On this journey Bhai Sahib was looking for like-minded individuals, this is how he came into contact with Jathedar Talwinder Singh Babbar. Bhai Amarjeet Singh secretly began working alongside the Babbar Khalsa who had been carrying out actions against the Narkdharis hierarchy. In 1981 an important action was carried out upon officer Niranjan Singh, a follower of the Narkdhari sect. Bhai Amarjeet Singh, Bhai Sukhdev Singh Babbar, Bhai Sulakhan Singh Babbar reached the Chandigarh secretariat. Bhai Sulakhan Singh was sat outside on his motorcycle whilst Bhai Sukhdev Singh and Bhai Armajeet Singh entered the building with a revolver concealed in a register document. Upon entering the building the Singhs spotted there target and opened fire, however Niranjan Singh managed to flee. Upon hearing the gunshots the public chaotically started running out of the building, both Singhs joined in the crowd, Bhai Amarjeet Singh managed to leave the building, but Bhai Sukhdev Singh was surrounded by the police. Bhai Amarjeet Singh joined Bhai Sulakhan Singh and opened fire at the police and managed to free Bhai Sukhdev Singh and all 3 Singhs managed to escape unharmed. Bhai Sahib continued to work for the Panjab Police whilst also performing his Panthic duties. Bhai Sahib and other Sikh officers would cover for one another when each officer was out punishing enemies of the Sikh Panth. On November 19, 1981 upon completing there missions of punishing Narkdharis in the Jalandhar and Kapurthla districts, Bhai Sahib and Bhai Tarsem Singh had attended a meeting in the village of Daheru, district Ludhiana. Also present at this meeting were Bhai Vadhava Singh Babbar (present chief of Babbar Khalsa), Jathedar Talwinder Singh Babbar, Tarsem Singh Kalasanghian (currently in Netherlands) and Bhai Gurnam Singh (colleague of Bhai Amarjeet Singh). The Panjab Police were informed of this by one of their touts, and headed by Inspector Pritam Singh Bajwa, the police in huge numbers descended upon Daheru village. The police surrounded the house in which the Singhs were sitting, and the owner of the house Bibi Nachattar Kaur was taken into custody. Bhai Amarjeet Singh and Bhai Tarsem were on the open roof of the house, when the police attempted to enter the house they were greeted with a hail of bullets. A long encounter ensued in which 3 police officers were killed including Inspector Pritam Singh Bajwa and Constable Surat Singh. Both Singhs managed to escape from the Police and ran into the fields. The police made an announcement stating that the Singhs were still in the village and if any local was to give them refuge or shelter, they would be regarded equally as guilty as the wanted Singhs. All villagers were strictly instructed to stay where they were and not to move. The farm workers were also told to stop what they were doing and be seated. The police wanted to catch the Singhs at any cost, at first sniffer dogs were brought in but to no avail, then a helicopter circled the village with hundreds of officers patrolling on the ground. Mircalously the Singhs managed to escape from the village. This was the first major encounter of the Sikh struggle movement, in which a handful of Singhs caused havoc amongst the police forces. From the ammunition recovered from the village, the police connected the Singhs to the Jalandhar and Kapurthla cases, and also discovered the identities of the 2 Singhs, Bhai Amarjeet Singh Khemkaran and Bhai Tarsem Singh. The police began hassling the family of Bhai Amarjeet Singh as to his whereabouts. Each time a case was linked to Bhai Amarjeet Singh, the local police of the area in which the incident occurred would arrest Bibi Malkeet Kaur and take her away for questioning. 17 separate village panchayats were involved in the release of Bibi Malkeet Kaur, but the police continued to harass her. As Bhai Amarjeet Singh was carrying out his panthic duties whilst being underground, Sant Jarnail Singh Khalsa sent a Jatha to Bhai Sahib’s family and offered them security within the Jatha. Bibi Malkeet Kaur along with her mother and brother Darshan Singh moved to Sri Darbar Sahib complex and lived under the guard of the Jatha Singhs. In January 1984, Bhai Amarjeet Singh came to meet Sant Jarnail Singh at Sri Darbar Sahib and began staying with his family at Sri Darbar complex. By this time Bhai Darshan Singh had also taken up arms and was involved in the Jatha activities. Bhai Amarjeet Singh was a very clever individual and would often pick up on the dirty tricks being played by the government to dis-unite the kaum, such as the rumours of the Babbars dislike of Sant Ji and their Jatha Singhs. Bhai Sahib being close with both Jathas, would quickly root out the troublemakers. Whilst Bhai Sahib carried out many actions alongside the Babbar Khalsa Singhs, he was extremely close to Sant Jarnail Singh. In June 1984, as the Indian army was planning an all out assault on Sri Darbar Sahib, Sant Jarnail Singh summoned all the Jujharoo Singhs inside the complex and instructed them to send their wife’s, kids, and relatives away from Sri Darbar Sahib. On the 1st of June 1984, the battle between the Hindustani forces and the Jujharoo Singhs began which lasted over 7 hours. On the 3rd of June the firing once again started, and at this point Sant Jarnail Singh instructed all the women and children to leave Sri Darbar Sahib with Giani Puran Singh. On the night of June 3rd, Bhai Sahib met with Bibi Malkeet Kaur and his 2 sons, Bhai Sarbjeet Singh & Bhai Gurpreet Singh at the home of Giani Mohan Singh. This was to be their last meeting. Bhai Sahib was positioned at Ghanta Ghar alongside Bhai Darshan Singh, both Singh’s fought bravely to keep out the Indian Army from entering the complex. In the end their guns fell silent and both Singhs attained Shaheedi.